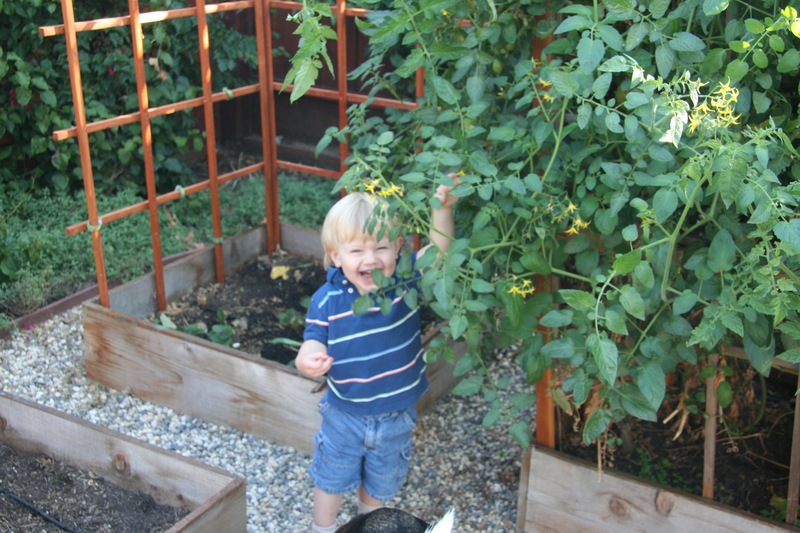 In 2008, I wrote a blog post about my initial success growing blueberries here in Silicon Valley. If you’ve read this far, chances are you think that replacing useless ornamental shrubs and bushes with gorgeous, fruiting blueberry bushes is a dream come true. Well, you too can live the dream. I’m happy to announce that growing blueberries in Sunnyvale is definitely a reality. This will now be my third season harvesting blueberries, and it looks like it will be a bumper crop this year. However, I thought it was worth putting together an update, because the second season was not very successful at all. In fact, it was lessons from the second year that really led me to do some research and come up with the techniques that I believe have led to a great 2010. Blueberries require acidic soil. Actually, according to eHow and other sites, the proper pH for Blueberries can be anything from 4.3 to 5.1. That’s pretty acidic, and much more acidic than any soil you are going to find in the Bay Area naturally. That means, you’ve got to add something to the soil at least annually for Blueberries to flourish. Traditional fertilizers can hurt Blueberries. Like most plants, Blueberries need nitrogren. However, they don’t handle it in nitrate form well, and it can lead to significant issues. You can use fertilizers made for acid-lovers like Azaleas. Instead, look for sulfer-based fertilizers. I strip about 1-2 inches of accumulated leaves and top soil off the area. 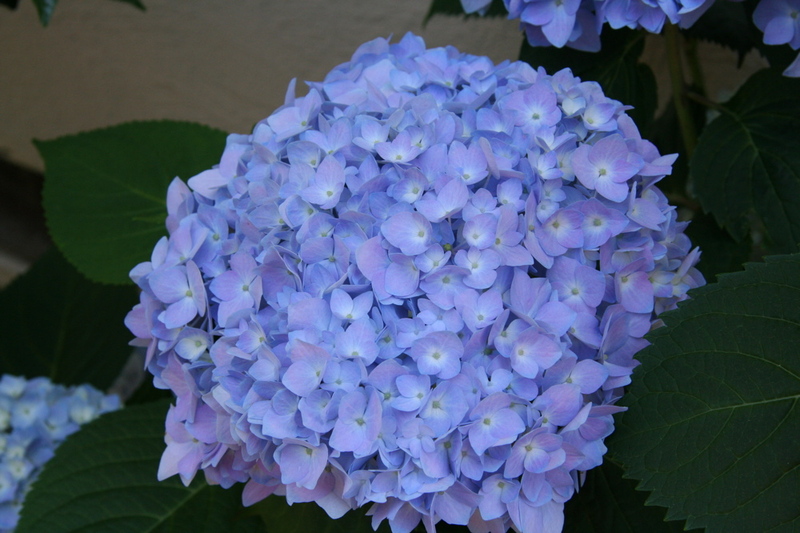 I use ammonium sulfate (purchased at Home Depot, in the garden section). I sprinkle liberally around the bushes, based on the package instructions. I put down a few bags (about 1 inch) of new top soil from bags. These bags contain fresh organic matter, which lightly fertilizes. I mulch the entire area. This is the part I got wrong in 2009. 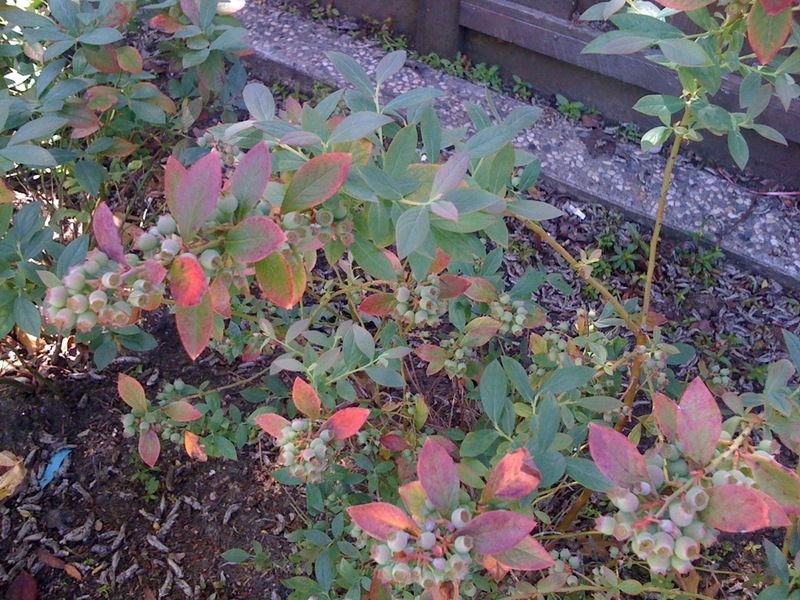 In 2009, as per some of the recommendations on blueberry.org, I waited to fertilize my blueberries until they started to flower. This was a huge mistake. In the end, I was left with a small number (<30) flowers per bush, and a very sparse crop. My working hypothesis was that, due to the warm winters in Silicon Valley, the plants never really go fully dormant, but do set based on the frosty nights in December/January. As a result, they bloom by February, as the weather warms but is still wet. A few articles on the web from other warm weather growers seemed to confirm this theory. As a result, this year, I decided to prepare and fertilize my blueberry bushes over Thanksgiving using the treatment I found at this tree website. I was actually very fortunate on the timing – we had quite a bit of rain in December, as well as a few frigid nights, so I felt like I did the work “just in time”. No harvests yet, but all eight bushes (four of each variety) are literally bursting with huge (20 berry+) bunches of green blueberries. I think there are at least 200+ berries per bush. 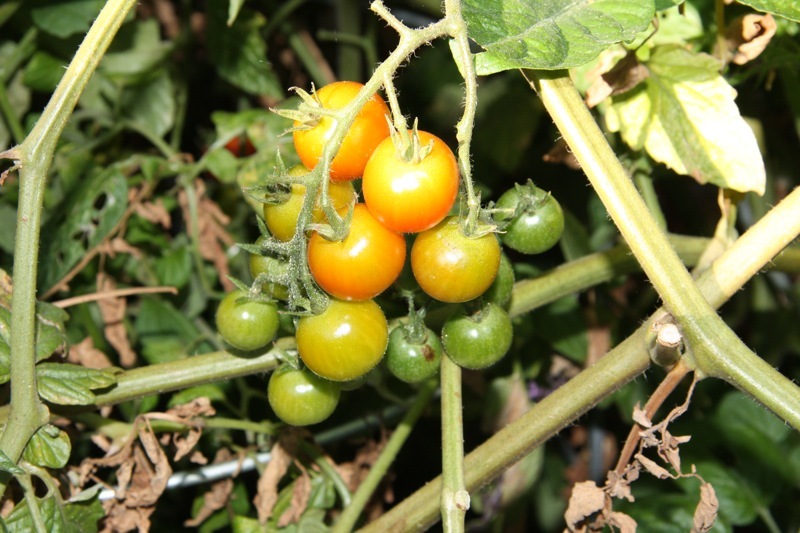 Barring some unforeseen tragedy, it looks like the early fertilization and preparation was key for preparing the plants to make the most of their fruiting season. Here is a quick snapshot that I tweeted out this weekend. You can see some of the leaves are still red from the winter, although there are quite a few new green shoots and leaves. I hope this helps any aspiring blueberry growers out there. It’s a real delight to pick blueberries in the morning on the way to work. I am proud to say that a little more than two months ago, I decided to follow a dream. A dream that I’ve had for a long time. A dream to grow blueberries in the warm, pleasant, and good-for-almost-everything-except-blueberries weather of Silicon Valley. Gorgeous, right? That’s the first bunch of blueberries off one of my eight (8), count them, eight blueberry bushes in my front yard. They were about 10 in this group, all large, all sweet, all as good as any I’ve had. And that’s just one bush! Fantastic for a first year harvest. Now some details for those of you out there who share the dream of growing blueberries in the Bay Area, but always thought that they were a cold weather, Maine/Alaska sort of thing. Misty (Vaccinum x Misty): Sky-blue, medium large, very sweet fruit matures early season from midsummer through fall. Pink and white bell-shaped flowers bloom in late spring followed by fruit crop. Very low chill requirement of 300 hours to set a good crop of fruit. An attractive shrub with blue-green foliage for beds or the fruit garden. Remains evergreen in mild winters or turns brilliant red before shedding leaves in cold climates. Semi-deciduous shrub. Full sun. Vigorous growth 5 to 6 feet tall and wide. It’s amazing how well they have taken. 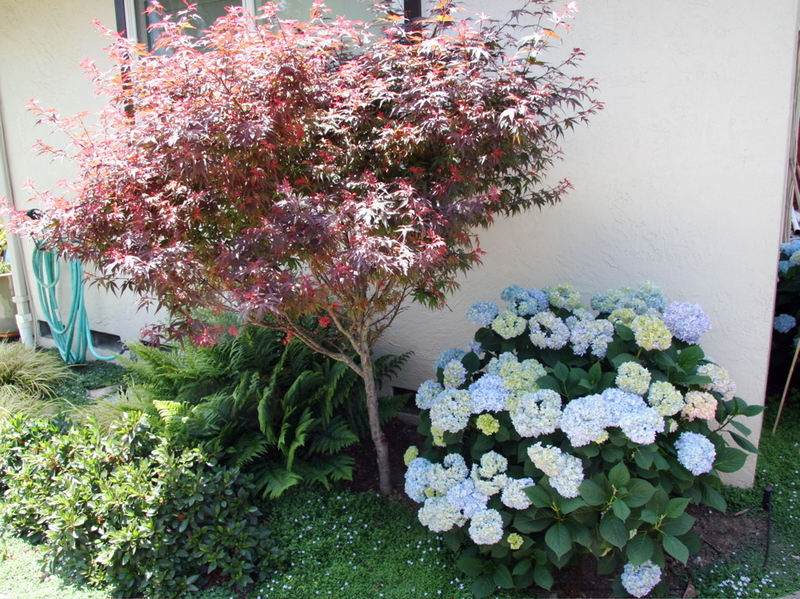 I planted them in an open stretch next to my driveway, where there previously were ornamental bushes. I added some additional flowers and bulbs (200+) for color. The flowers are extremely pleasant and fragrant, and it’s nice to have both white and pink flowering varieties. Here is a shot of the complete row on March 29th, a couple weeks after planting. You can see the bulbs have sprouted, and the flowers on the bushes have now been replaced with hundreds of green blueberries. 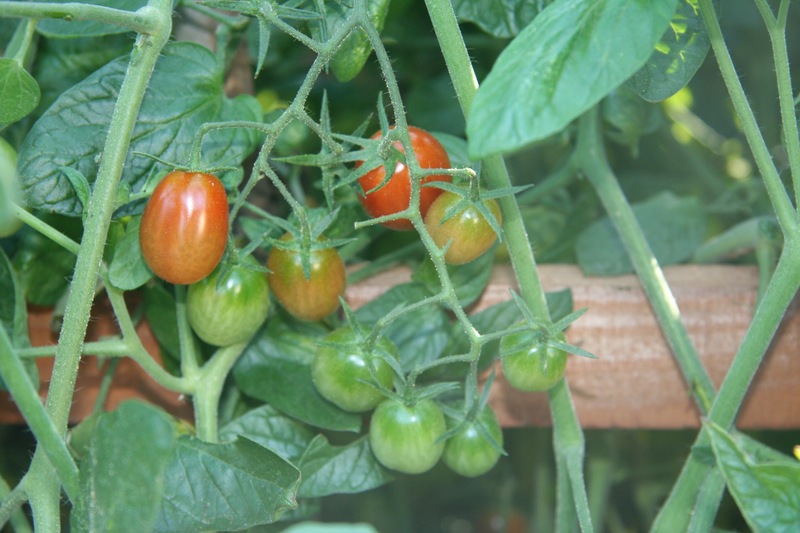 They should be fully ripe in late June, early July at this rate. I was a little paranoid about watering, and ended up putting in a new trench and line for daily watering. Simple drip heads (4) with spray for 20 minutes a day in the morning. 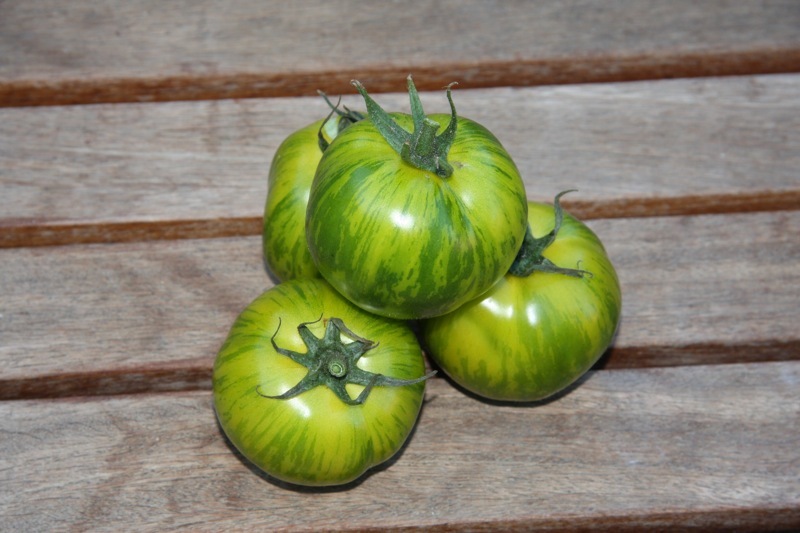 I’ve been a bit surprised at the ongoing popularity of the one or two posts from last year on my tomato harvest, particularly the pictures of my Mr. Stripey tomato. 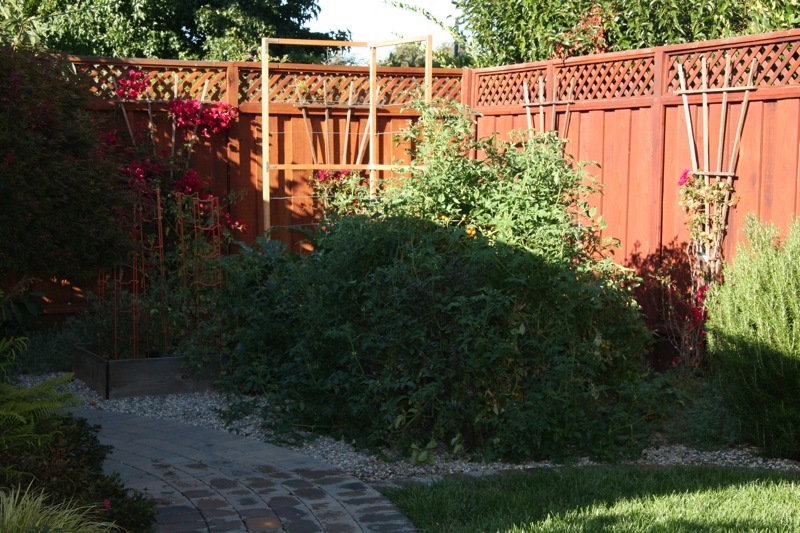 As a result, I thought I’d post an update for 2007 on my garden. 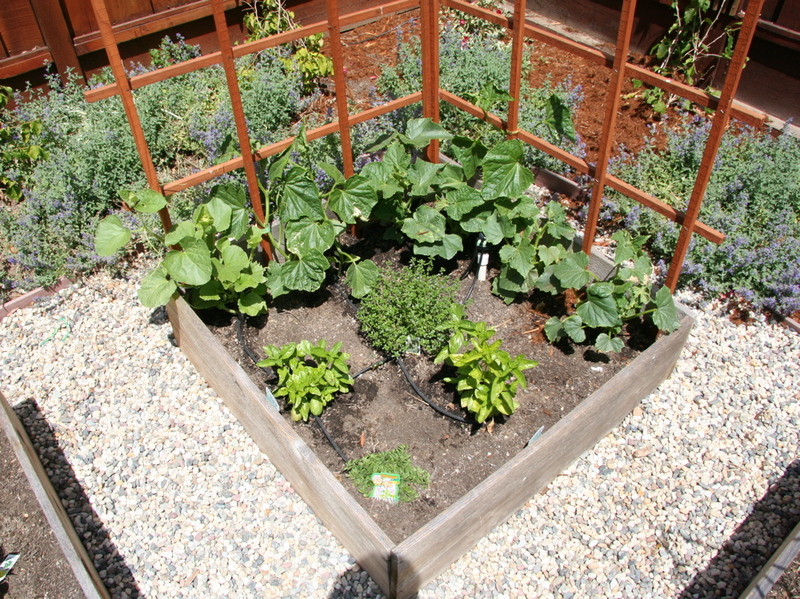 I love working in the garden – my only regret is that I only have 3 garden boxes to work with. Of course, that’s about 10x the space I had a few years ago when I was growing plants on the balcony of my apartment. 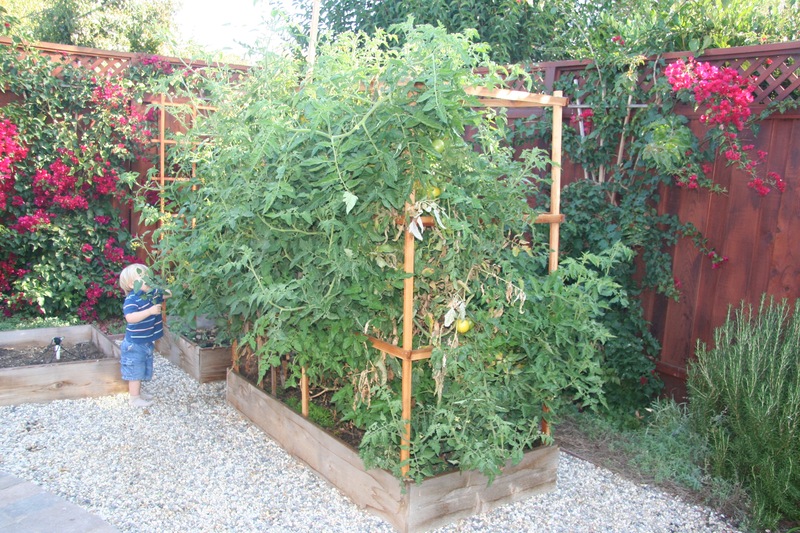 I also grow cucumbers, using a trellis so I can get a large crop with very little space. This year, I’m growing four varieties of cucumber. Two years ago, my Japanese cucumbers reached almost 2 feet (24 inches) in length, so I’m trying to build on that success. I’m excited about the last one, because I’ve never grown Armenian cucumbers before. They apparently are light green skinned, and can grow to 3 feet long! Should be fun. 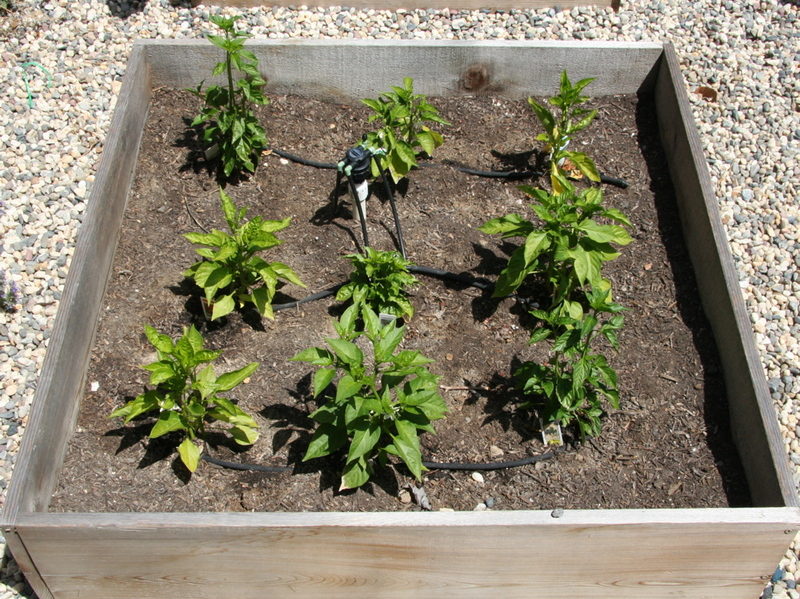 The plants in the bottom corner are herbs that I use to fill out the box – basil, oregano, thyme. 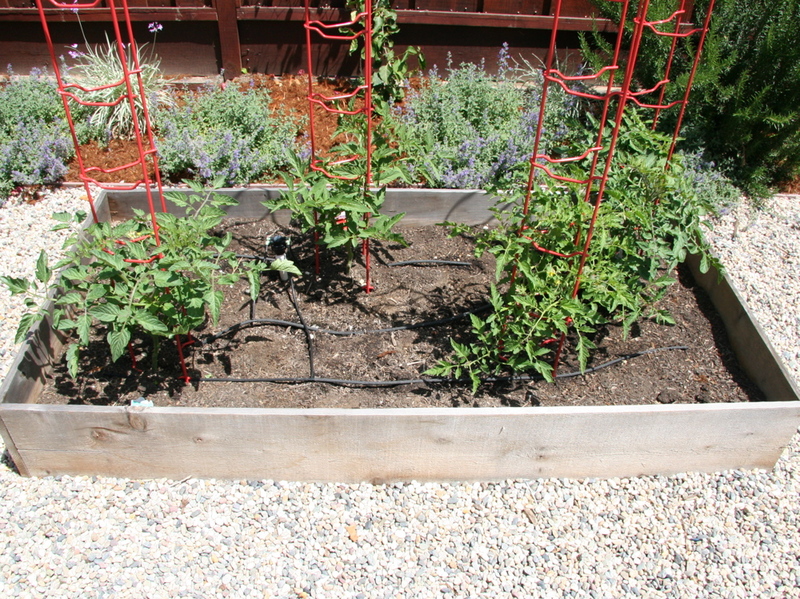 And finally, my prize plants, the tomatoes. This year, I’m trying to stretch a 3×6 box to handle 4 plants. I’m also trying out a much more robust 7mm steel support for the plants after last years disaster with my huge plants bending the smaller steel frames mid-August. I got them at Gardener Supply online. 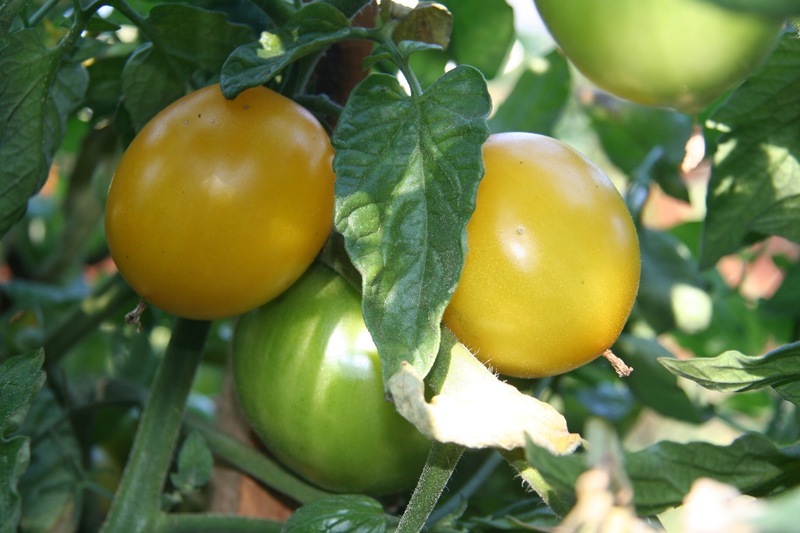 The four varieties of tomato this year feature two hybrids for volume & eating, and two heirloom varieties for flavor & fun. I’ve had them in the ground for four weeks, and they are really doing well. See below. Should be a great year for the garden. Everything is really taking off. I feel like Brie from Desperate Housewives, but even my Hydrangeas are doing fantastically well. 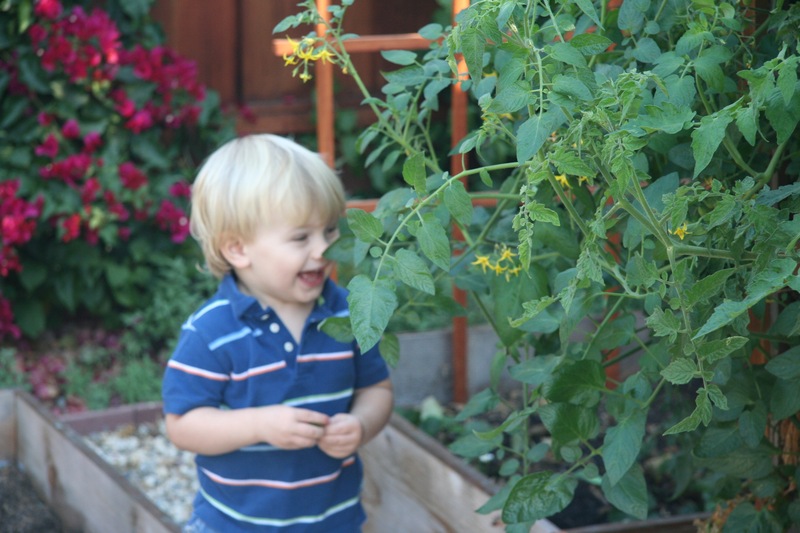 It may seem weird to talk about tomatoes in December, but the time has come to say goodbye to my tomato plants from my first year growing them here in Sunnyvale. 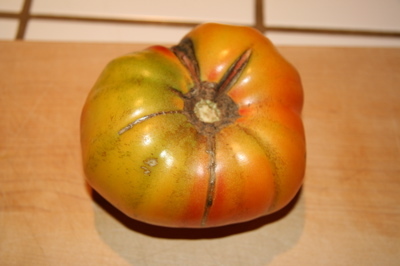 Mr. Stripey is a heirloom variety that uniquely produces a red and yellow striped fruit. I harvested most of these in the summer, but there were a few still growing on the vine, and I found one more good one to close out 2006 a couple of weeks ago. 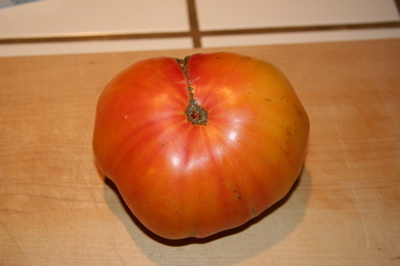 This one wasn’t as ripe as others, so the red looks a bit pink. 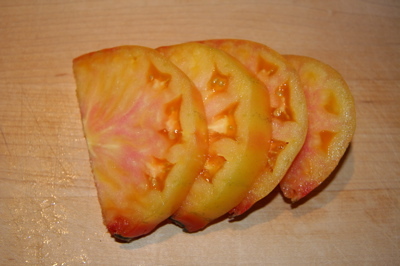 Still, you can see the unique, mottled interior, and based on the fully sliced fruit, appreciate the size. I noticed on most gardening sites Mr. Stripey doesn’t get very high ratings. 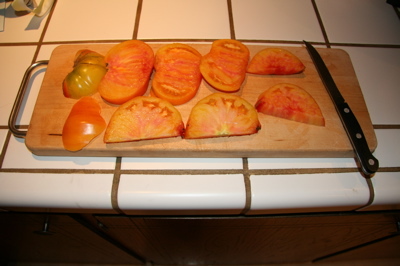 True, the vine didn’t produce a lot of fruit (maybe 6-12 good tomatoes through the season), but I thought it was a lot of fun to have this multi-colored tomato. 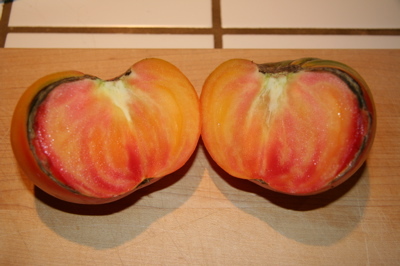 We found it very sweet & firm, and definitely colorful. 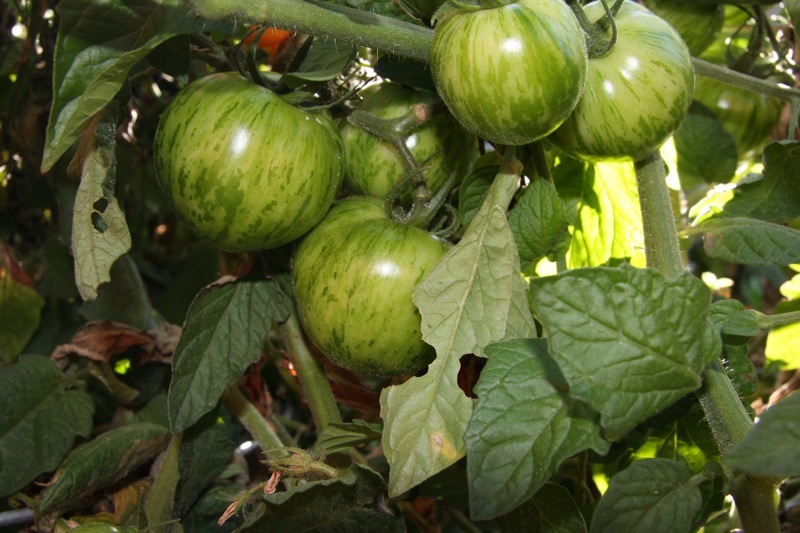 One of the comments from my last post on my 7 foot tomato plants was that I didn’t include a picture of Mr. Stripey. So here it is. Anyway, the vines are coming down next weekend, even though they are still bearing fruit. I’m pretty sure these frosty mornings are going to kill them soon, and I’m not eager for the first serious rainstorm of the winter scattering tomatoes everywhere. 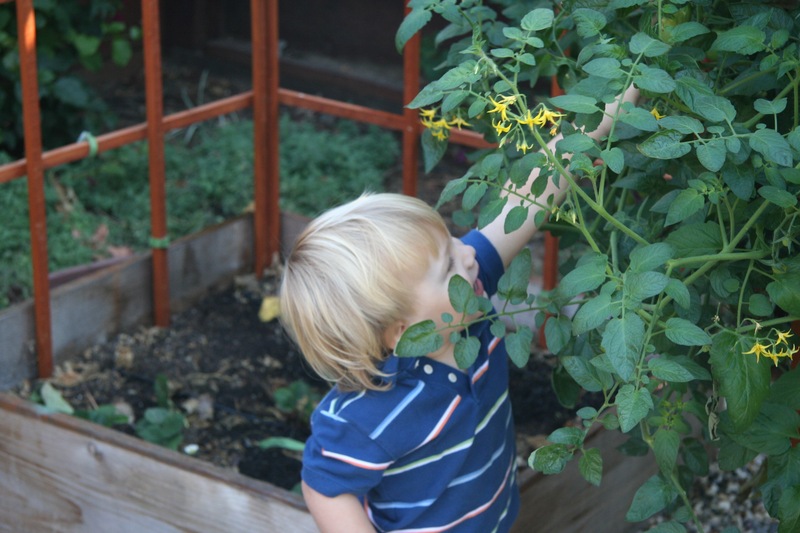 I feel lucky to live in Silicon Valley, though, where I can actually harvest my garden into December. Very lucky.